Connecting Cities is an office for urban planning and design, consultancy and research in the field of sustainable urban transformation and development. Connecting Cities is part of an (inter)national network of planners, designers, academics, experts, developers, consultancies and universities in different cities. This makes that Connecting Cities is capable to select team for each project that connects and combines knowledge and experience from different disciplines and cities. Hence the name ‘Connecting Cities’. Focal activities of Connecting Cities are urban analyses and design, urban transformation and the organisation of workshops and charettes for specific topics and assignments. 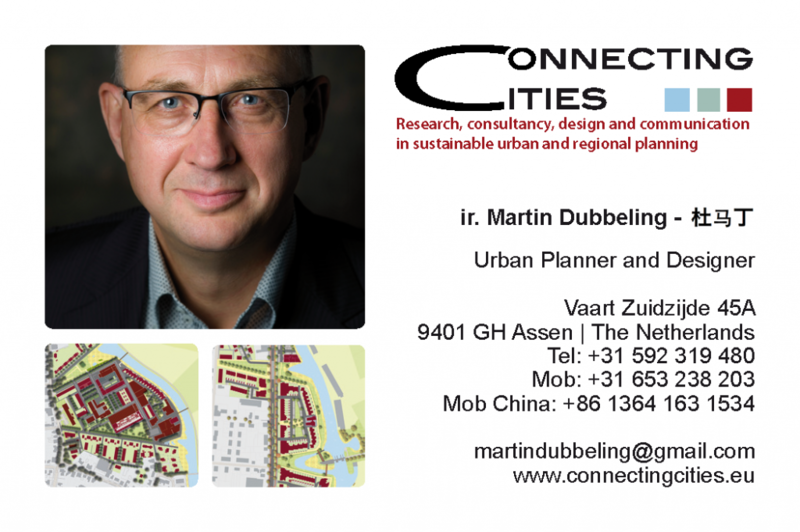 Connecting Cities focuses on research, consultancy, design and communication in sustainable urban and regional planning. For these activities Connecting Cities works closely together with experts and associates in the Netherlands, Europe, Asia and the USA. Connecting Cities is capable to select teams with international experts on very short notice for strategic urban design and spatial planning policies. In recent years the teams of Connecting Cities have worked on a wide variety of projects, from integrating water storage and green recreational zones in dense urban areas in China to small-scale transformations and interventions in smaller cities in the Netherlands. Connecting Cities is not only active in urban design, but also in the organisation and management of projects, processes, design competitions, seminars and publications.